It was among the first groups of the Special Forces to be officially formed. The group is responsible for operations in the Pacific. Currently, the First Battalion is stationed at Okinawa while the 2nd, 3rd, 4th, and Group Support Battalions are stationed at Joint Base Lewis-McChord, Washington. 1st Special Forces Group holds the distinction of having the first (Captain Harry Cramer killed 21 October 1957), and last (SGT Fred Mick killed 12 October 1972) Special Forces men killed in Vietnam. Captain Cramer's name was left off the Vietnam Memorial when it was opened in 1982 due to the secretive nature of his mission and that the extent of America's involvement in Southeast Asia was not known in 1957. However, his son appealed to the National Park Service, and in 1983 Captain Cramer's name was added to the Memorial. Following the war in South Vietnam, and the withdrawal of American military forces in Southeast Asia, the emphasis on military actions shifted away from the Pacific theater and focused more on Europe and the NATO Allies. Special Forces, which had grown to a total of seven groups in 1963, faced severe cuts in the peacetime army, as a result 1st Group was de-activated 28 June 1974 at Ft. Bragg, NC. After a 10-year hiatus the need for an Asian unconventional warfare force was recognized and Alpha Company, 1st Battalion was reactivated at Fort Bragg on 15 March 1984. This company and the remainder of 1st Battalion were assembled and deployed to Torii Station, Okinawa during the spring and summer of 1984. 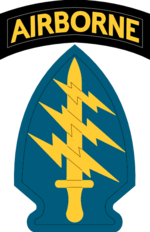 The 2nd and 3rd Battalions, along with Headquarters and Service Company were officially reactivated 4 September 1984 at Fort Lewis, Washington. Brought back to life as part of an overall growth in the support to U.S. strategic efforts in Asia, the unit focused on the Pacific Command area of operations but were routinely deployed out of Asia to support unified commanders throughout the world. Unit members supported theater security engagement within the PACOM area of operations, contingency operations in Haiti, Central Asia, and Bosnia. Operational Detachments "Alpha" deployed to Haiti to conduct Coalition Support Team missions in 1993–94 in support of U.S. Joint Task Force 190 and Multi-National Force operations supporting Operation Uphold Democracy. Additional ODAs conducted Humanitarian Demining Operations in Laos, Thailand, Cambodia, and Vietnam earning Humanitarian Service Medals for their efforts in both Laos and Thailand. Elements from the 1st SFG (A) conducted training with military units from newly created states from the former Soviet Union that supported development of the Central Asian Battalion (CENTRASBAT), a regional peace keeping force in the mid-1990s. By the end of the millennium, 1st SFG (A) soldiers had deployed in support of OPERATION JOINT GUARD. Following the September 11 attacks, members of the 1st SFG (A) were quick to answer President George W. Bush's call to action, deploying individual soldiers to support Operation Enduring Freedom in Afghanistan and deploying back-to-back battalion rotations to the Republic of the Philippines. Starting in February 2002, elements of the 1st SFG (A) deployed to conduct unconventional warfare in the Southern Philippines by and with the Armed Forces of the Philippines (AFP) in order to assist the Government of the Philippines (GOP) in the destruction of terrorist organizations and the separation of the population from terrorist organizations. Over the next three years, 1st SFG (A) members built an admirable record in the Philippines training six light infantry battalions, three light reaction companies from the Armed Forces of the Philippines (AFP), treating over 31,000 Filipinos in MEDCAP events, helping to professionalize the AFP and providing operations and intelligence fusion teams to actively assist the AFP in targeting terrorist cells. Due to its efforts, the Province of Basilan was no longer a haven for terrorists, and the AFP continues to make progress against terrorist groups in the Southern Philippines. For its tremendous efforts, the 1st SFG (A) was awarded the Meritorious Unit Commendation on 24 January 2004 for its outstanding meritorious performance in a difficult and challenging mission while supporting the Global War on Terrorism in Asia. Throughout 2003–2004, the 1st SFG (A) deployed many soldiers in support of OPERATION IRAQI FREEDOM and OPERATION ENDURING FREEDOM in Iraq and Afghanistan. By November 2004 the unit deployed an entire battalion to Afghanistan as part of the Combined Joint Special Operations Task Force- Afghanistan (CJSOTF-A). Today, 1st SFG (A) continues to support the Global War on Terrorism with operations in the Philippines, Iraq and Afghanistan as well as maintaining US security relationships with partner nations throughout the Pacific. ^ "Green Beret Killed by IED Was on Patrol with Afghan Special Forces". military.com. 26 August 2016. This article incorporates public domain material from the United States Army Center of Military History document "Lineage and Honors 1st Special Force Group".